Verizon (s vz) announced the iPhone’s ability to act as a personal hotspot Jan. 11, but yesterday’s release of the iOS 4.3 beta confirmed that the feature will eventually make its way out to all iPhones (s aapl), minus legacy devices — carriers willing. With the hotspot enabled, you can share your data connection with multiple Wi-Fi devices, including the iPad, something which wasn’t possible through wired USB or Bluetooth tethering. I realized immediately that not only do I no longer need a MiFi, as Kevin pointed out yesterday, but I no longer even need the 3G in my Wi-Fi + 3G iPad. I use the iPad’s cellular data connection sparingly as it is, and I’ve never run into a situation where I had my iPad but not my iPhone while on a trip or out and about. And not renewing my iPad data contract will save me at least $30 every month with my provider here in Canada. Canadian providers don’t charge extra for tethering services, unlike in the U.S. But even when you are charged extra to enable personal hotspot features, which is a better proposition? An extra $30 for a shared connection that you can use with any device, including notebook computers or the iPod touch, or roughly the same amount of money for a whole other data plan locked to a single gadget? AT&T may only be “evaluating” the feature at the moment, but eventually it’ll have to give in, just as it did with tethering, and I’m willing to bet it won’t take the company as long this time around. In fact, once Verizon (s vz) announces its own pricing scheme for iPhone hotspots, or, failing that, once AT&T (s t) begins hemorrhaging customers and freeing up bandwidth on its data network, we’ll see the feature on both carriers. Once personal hotspot capabilities make it out to all iPhones, the question quickly becomes: Why have a 3G-enabled iPad at all? Buying the Wi-Fi-only model will save you $130, which can be spent on the next model up in terms of storage capacity, while still saving $30. Apple could still make the 3G iPad desirable to consumers by allowing it to act as a personal hotspot, but the iOS 4.3 beta shows no indication that Apple intends to go back on its current “no tethering policy” for the device. Even if the iPad were to gain hotspot abilities (which it might to keep feature parity with Android (s goog) tablets), it still wouldn’t hold as much appeal as the iPhone, or any Android device with the same feature, since it’s far less portable and unlikely to be carried by most people during the course of a normal day. My next iPad will be Wi-Fi only, provided Apple continues to offer a non-3G option in its next generation tablet. As Stacey foresaw more than a year ago, consumers will only need (and likely have budget for) one cellular network-connected device that can share to a variety of Wi-Fi hangers-on, and all indications point to that device being the iPhone for those operating in Apple’s mobile ecosystem, not the iPad. Are we forgetting that the iPad 3G has a battery that will last 9 hours? Yeah go ahead and use any phone as a hotspot for the iPad and see how long that works out. There is no setup with a cell radio in an iPad. Do you really want to look like that much of a tool getting the hotspot thing going? It is a big inconvenience to do the setup when all you have to do is go with an iPad 3G. The main reason is battery life. My iPad 3G always arrives home with 40% or more battery left. My iPhone arrives home on 10% even without using it as a Wi-Fi hotspot. My iPhone would be dead all the time with the amount I use my iPad. Another reason is you don’t save that much. Personal Hotspot is just Wi-Fi tethering. Tethering costs $20/month. My iPad 3G costs $30/month. Finally, on a CDMA network, when a call comes in, not only would your iPhone be booted off the network, but so would your iPad. iPad is a mobile PC. It wants its own data connection, same as a mobile phone wants its own. I imagine if you got the wifi only ipad a smart GPS app developer could create an app for the iphone to share its GPS data with the GPS app on the ipad. Or better yet, make sharing GPS data an iphone hotspot option. Then you really would make the 3G ipad irrelevant! Some people dont have personal hotspots… so they need the 3g on the iPad. If the 3G iPad gains the personal hotspot feature of the iPhone you could have a Verizon iPhone and an AT&T iPad (or vice versa) so that if you’re in an area where one or the other doesn’t have reception you will still be able to use both. If that’s what happens I’ll get one on each carrier so I’m not SOL if I’m in a dead zone. And the 3G versions have a GPS built in. hot spots have existed in Nokia phones a long time. * GPS and Google Maps or location aware Apps. Wifi location is okay, but limited and the iPhone screen looks so small after using the iPad. If Apple decides outside the US to allow iPad tethering with Wifi, the iPad becomes a great MyFi device. Not as portable as other MyFi but you can also check email and surf the web without an extra device. Most non-Apple devices support this now like my old Nokia phone and most Androids. The lack of tethering was the sole reason I decided to wait for the iPad 2 to buy a 3G version. Last week I tethered my iPhone 3GS to my Laptop to share Wifi so I could so them Netflix on their TV through my Wifi only iPad (since the 3GS can’t send Netflix Video out like the iPhone 4/iPad). They loved Netflixs, worked great on 3G speed, but was mess to setup. Assuming the carriers allow it Wifi Tethering just makes demos like this much simpler. I had to use a laptop as a $2000 wifi doggle. Funny thing will be to see if Apple will let people with multiple iDevices to use Facetime over Tethered 3G Wifi since you can’t do it directly on 3G. But finally, after Steve had to ask 500 people to turn off MyFi at the WWDC I think Apple will be careful how many devices they will allow this on. Of course, the 500 devices must have been either non-Apple or jail broken. I wonder how many people use jail broken iPad 3G’s as MyFi’s already? 1. Not all iPad owners have iPhones or phones with hotspot. 3. Battery issues when the phone hotspot is turned on. Have you used an Android 2.2 with hotspot turned on lately? 4. As someone mentioned here CDMA iPhones cannot access data during phone calls making your iPad unusable for online work. I am sure there plenty of other reasons so NO the iphone hotspot will not make iPads 3G obsolete. Don’t get me wrong though, I still love the fact that we will be able to create personal hotspots with our phones! No because the 3G antenna is much bigger/ better in the iPad than the iPhone (even ignoring the whole anntenna gate thing). And you can maximise your coverage by having two different carriers – one in each device. On that Verizon iPhone, at least, you won’t be able to browse the web on your iPad while you’re on a phone call if you only have your iPhone as a “hotspot”. (Maybe lukewarmspot would be more descriptive.) It’s also going to significantly decrease your battery life on either carrier. I think it’s a little premature to depend entirely on a phone alone for network access for multiple devices. But, it’s never too soon to publish hit bait. Well I bet articles like this one is exactly why Apple sometimes lock their devices and not allow personal hotspots, tethering and such. What your saying is if we get personal hotspots I will go for the cheaper iPad model. Well gz I think your thinking like everybody else so why write articles about it? Poke Apple in the eye with something so obvious just feel stupid to me. Whether or not articles point out the glaringly obvious use case is pretty irrelevant. Apple locks dialup networking, MMS, etc., based on carrier agreements (hence restrictions on AT&T that aren’t on international carriers), and doesn’t get a cut of 3G subscriptions. All Apple wants to do is sell more iOS devices. If they sell fewer 3G versions, they’re probably just selling more wifi versions. Not good for carriers, not bad for Apple. The cheaper iPad model isn’t necessarily the less profitable one. Without cellular radios, it’s entirely possible that wifi iPad yield better margins. I predict that within 18 months, 3G/4G tablets will have proved to be a fad. Most consumers aren’t going to pay $150-200 a month for the privilege of carrying separately provisioned phones and tablets. I was tethering my wifi iPad on my Android phone from day one, and never understood why people were so anxious to buy the 3G iPad when it was launched, especially in light of the severe data caps imposed by AT&T. I asked the same question as the author and i think it’s shortsighted to not ask question like this! 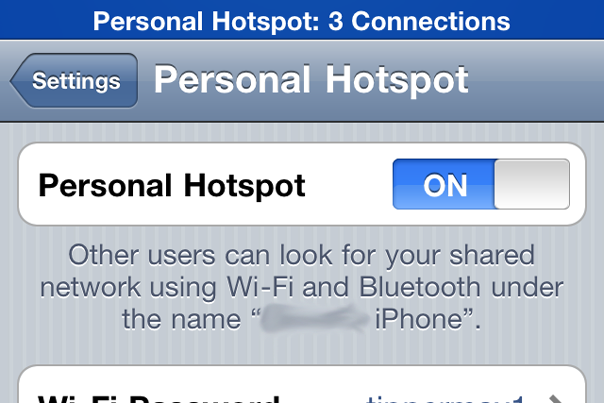 Will Apple lock the iPad against the Personal Hotspot or will the personal Hotspot not accept a iPad client? I think these are very interesting questions. Why? Because I don’t think that apple is one of the tec companies who don’t think before they do something. And even this “bug” works at the beginning so Apple will erase it with an update of one or both devices, when they are getting in trouble to sell 3G iPads. It seems shortsighted to question “why have a 3G-enabled iPad at all?” when there are still plenty of those among us who do not and will never have an iPhone but do own and use 3G iPads extensively. One other difference that the 3G version has over the WiFi only one, is GPS.